— Em tibi autem! — Quidnamst? — Lupus in fabula. — Pater est? — Ipsust. — But look! — What is it? — Talk of the devil! — It's my father? — In person. 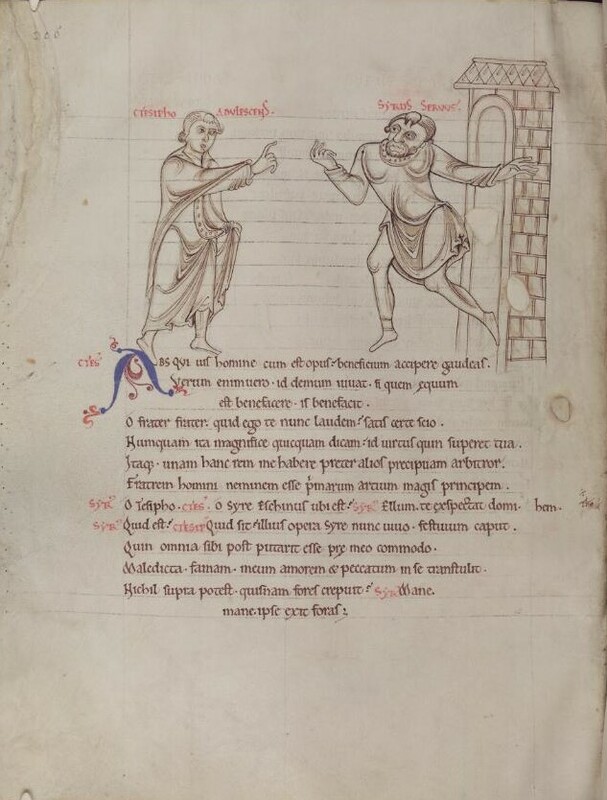 Scene from Adelphoe with Ctesipho and Syrur from Terence's Comedies, in Latin, St Albans Abbey, mid 12th century. When you speak of someone or something and they or it suddenly appears, almost as if you were calling or summoning them, this proverb is perfect. An English equivalent would be to Speak, or talk, of the Devil, and you use the Latin version in just the same way. Download a pdf and a recording Get an audio file and a print-ready PDF of Cicero's letter to Atticus in which he uses the proverb "Lupus in fabula". Click Here. 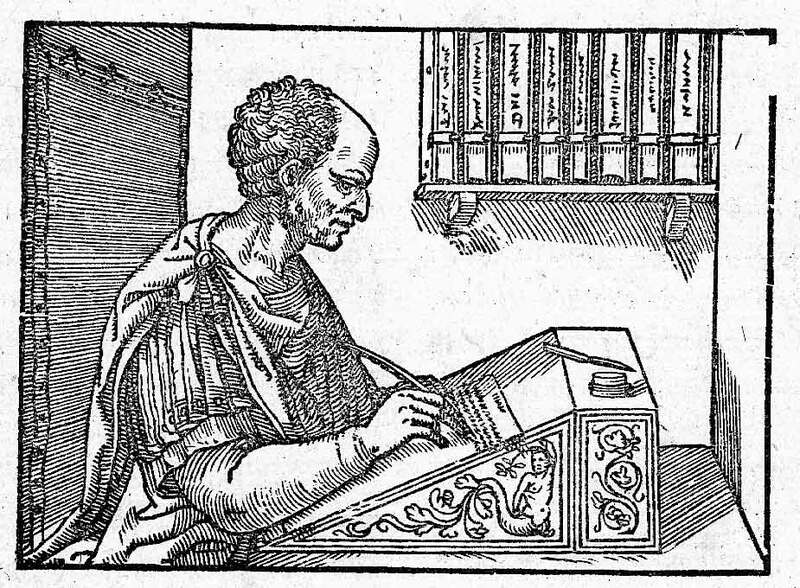 Cicero at his desk writing Epistulae ad Familiares, woodcut from 1547. As mentioned, in English you can say speak of the Devil or talk of the Devil. Two versions of one proverb, that ultimately mean the same thing. For Latin, it is the same. This proverb, to speak of someone as a way of summoning them or perhaps as a warning of keeping your tongue, is found in different versions all around the world. Some speak of dogs, cats or wolves, other proverbs of donkeys, devils or tigers, and yet others of kings, lions and trolls. Speak of the devil and he’s presently at your elbow, etc. The French do the same but derive their proverb from the Latin with their Quand on parle du loup, (on en voit sa queue), i.e. "When one speaks of the wolf, (one sees its tail)." The Swedes are a bit more superstitious and instead uses trolls: När man talar om trollen, så står de i farstun, i.e. ”When you speak of the trolls, they’re in your hallway.” The second half is rarely used. The Danish and Norweigians are perhaps the most optimistic as they say: Når man taler om solen, så skinner den/Når man snakker om sola, så skinner'n, which translates to "When you speak of the sun, it shines." Lupus in Fabula in other languages? Dansk: Når man taler om solen, så skinner den. Deutsch: Wenn man vom Teufel spricht, kommt er gegangen. Español: Hablando del rey de Roma, por la puerta asoma! 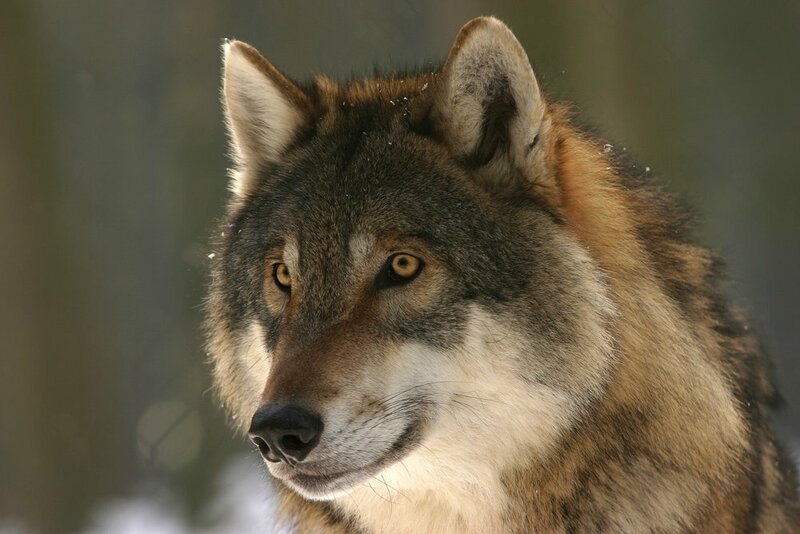 Français: Quand on parle du loup, (on en voit sa queue). Norsk: Når man snakker om sola, så skinner'n. Svenska: När man talar om trollen (så står de i farstun). Português: Falando no diabo, aparece o rabo. Terence. Phormio. The Mother-in-Law. The Brothers. Edited and translated by John Barsby. Loeb Classical Library 23. Cambridge, MA: Harvard University Press, 2001. Cicero. Letters to Atticus, Volume IV. Edited and translated by D. R. Shackleton Bailey. Loeb Classical Library 491. Cambridge, MA: Harvard University Press, 1999. Plautus. Stichus. Trinummus. Truculentus. Tale of a Travelling Bag. Fragments. Edited and translated by Wolfgang de Melo. Loeb Classical Library 328. Cambridge, MA: Harvard University Press, 2013. If you like proverbs with wolves, you can learn more about what holding a wolf by the ears mean in Latin here. If you want to help out, consider supporting Latinitium on Patreon by clicking below.